Designed to cut different materials precisely straight and parallel. 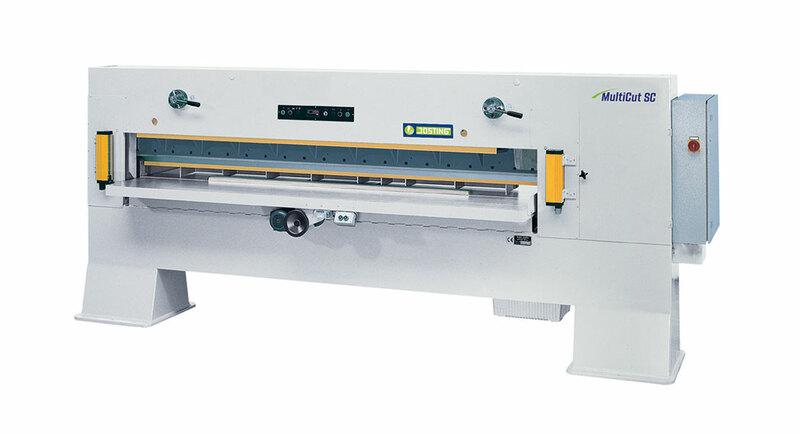 The Single Knife Veneer Guillotine MultiCut SC cuts of highest quality thanks to the swinging and powerful drawing motion of the knife at an angle of approx. 20°. Parallel fence with high-speed motordriven positioning, fine adjustment and digital gauge for cutting parallel face veneers and edge lippings. Clearly visible marking of the cutting line by means of a green guide light. Guide markings and an angular fence on the machine table for easier alignment of the material. Broad pressure bar for pressing even wavy veneer materials and level prior to cutting. Finishing cut facility with hydraulic adjustment of the cutter bar by 0.9 mm. Precutting and finish-cutting of the pressed material produces right-angled cut faces. Powerful crank drive enables the cutting of veneer across the grain. High pressing and cutting forces are reliably absorbed by the heavy-duty construction. Precise and permanent parallel guidance of machine components. Knife with 30 mm grinding allowance for longest possible use. Intermittent operation of the drives results in a low energy requirement and a low level of noise. Occupational safety regulations are met by a light barrier safety device, two-hand operation, electric safety control system and protective gratings at the rear. We reserve the right to make technical modifications without notice.